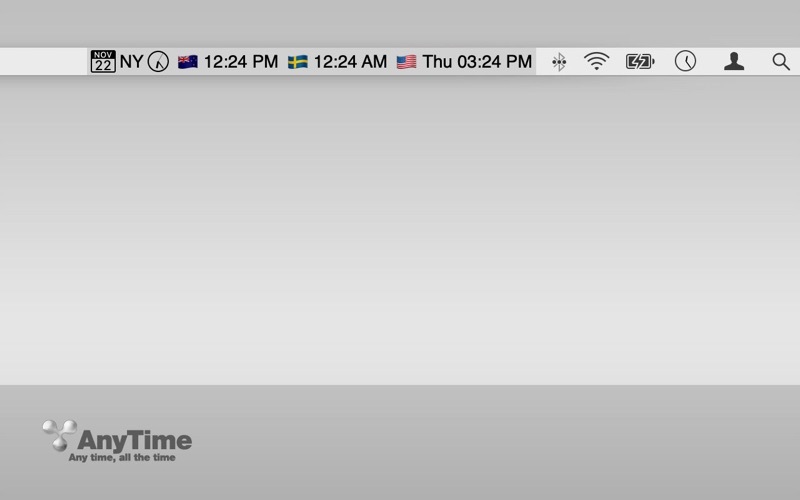 AnyTime - All the Time Place multiple clocks in your taskbar (menu bar). 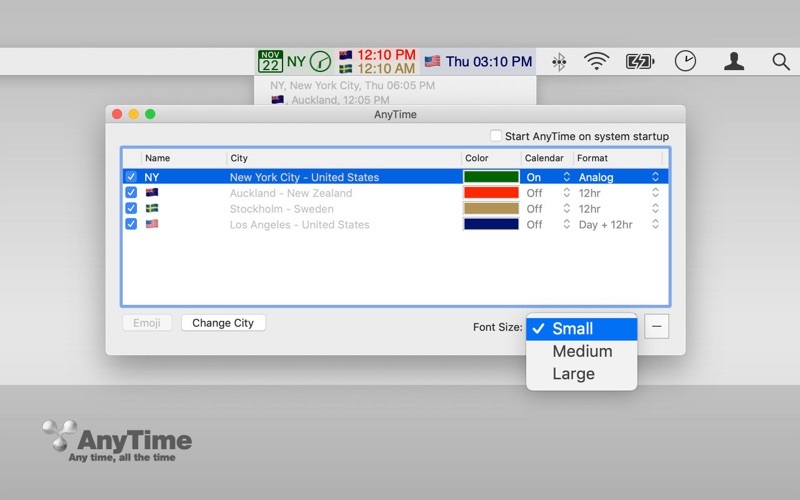 Multiple time zones are now always in your view. Color code options for easy reference. Perfect for working across world offices. 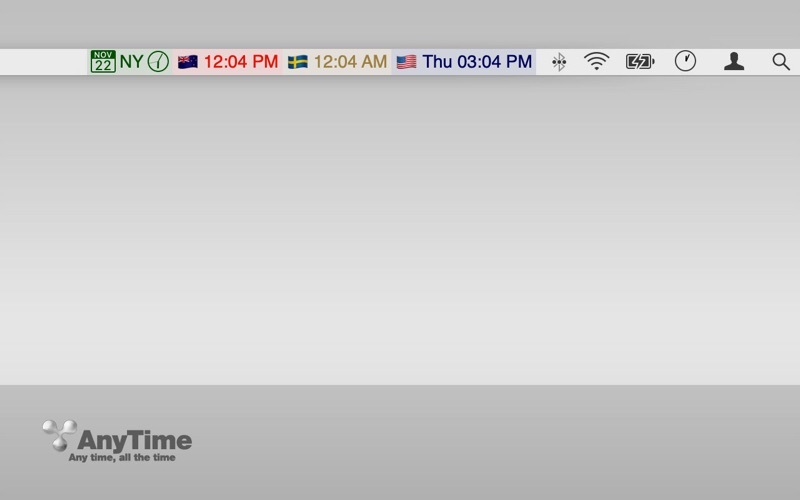 No extra clicking to see what time it is across the United States or anywhere in the world. Features - Always In Your Taskbar (Menu Bar) - Color Code Options - Capable of Displaying 10+ Clocks¹ - Auto-Update for Daylight Savings - Doesn’t Prevent Your Computer from Sleep Mode - Multiple Monitor Support - Autostart at Login Option Tip: Replace Your Standard Clock Control-Click the standard Mac clock Open Date/Time Preferences Click the ‘Clock’ tab Uncheck ‘Show date and time in menu bar’ Add your time zone to the AnyTime app. Tip: Open At Login - Select in Settings or: Control-Click the icon in your dock. Click ‘Options’ Click ‘Open at Login’ ¹ Limited by screen real estate. If you have many clocks enabled and are using a program which uses many taskbar menu options, the clocks will automatically hide. 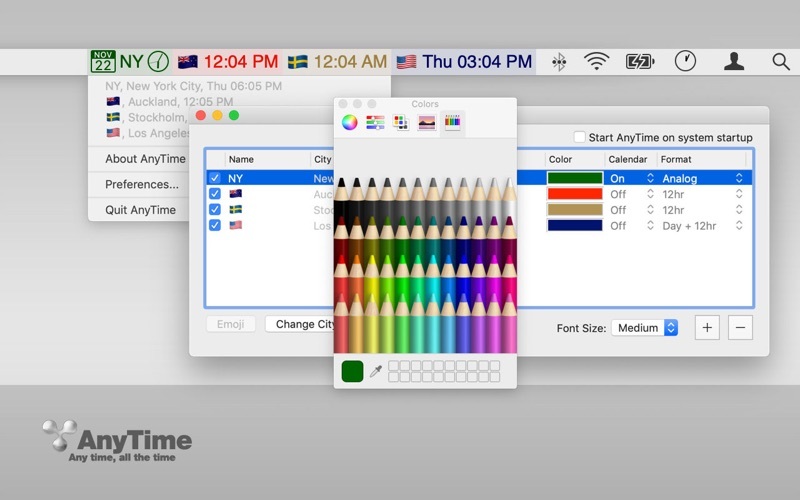 Reduce the number of clocks to enable viewing. couldnt get this to work at all. The only thing on the task bar is the symbol. the clock never came up. The only problem with this app is that, it stays in the dock. I don’t want to see it in the dock, only the menubar is enough. But there is no option to hide the dock icon. Preferences are not enabled, app does not function on 10.10. The creator’s support link points to a non-functional website. “404"
My manager is in Zurich, I’m in Chicago, and a lot of my team is in Chennai. Having instant access to all 3 time zones is great! For the first 2 minutes, I thought I might have bought a lemon and was worried. 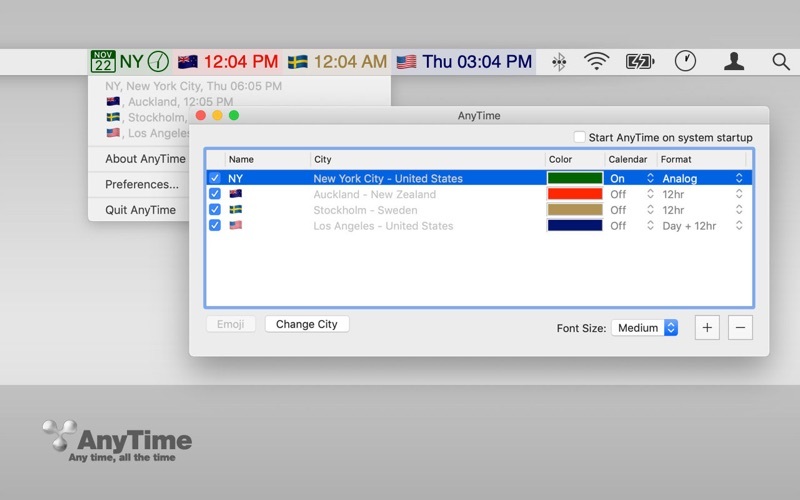 Then I figured out you were suppoed to use the drop down menu for the continental area, then choose the applicable city closest to your time zone, and then add more. The immediately show up at the top, so i took off the main one in my OS X preferences. The only gripe I can find, and the reason I gave it 4 and not 5 stars, is that there are so few city options available. Since I live in Europe but work mostly in Texas (virtually through the internet), it would be nice to see a TX up there, but my only option is Chicago. In order to provide adequate optiosn they’d probably have to go to a map and not mere drop down menus, which would take bit more programming but make the user interface much easier. Anyway, if you are reading all these negative reviews, just know it was by impatient people who didn’t figure out how the darn thing works. But it does, and it is actually quite easy to use. Works great - for what it is! This app is very poorly designed. Outside of LA, NY and Chicago there aren't many more U.S. cities to pick from and no way to add because the list is pre made. I'm from Texas and there isn't any way to know what time it is there using this app because it's awful. If your city isn't on their SMALL list of cities around the world, forget it! Not to mention I opened it once, closed it, and now it won't open again. I would please like my money back. Apple, do a better job of not letting junk like this in the app store. very difficult to add the specific city you want to add. uninstalled after about 15 minutes of fighting with it. This app works reasonably well. However, there is no option to hide the AnyTime icon from the dock bar when it is running (i.e all the time), which I find to be an incredibly annoying waste of dock real-estate - so much so that I am not going to use this app.